Such is the level of organisation and expertise needed by coaches in all wheelchair sports that it is clear safety is taken very seriously. Not only can injury deprive a player of their ability to take part but it can also ruin the game for fellow competitors. Of course players must accept some responsibility for both their own safety and the safety of others by playing hard but fair, and not allowing the heat of battle to result in frayed tempers. Nobody wins if boundaries of good behaviour are crossed. But not only can foul play result in injury. Simply neglecting a set of warm-ups can be equally painful, so remember to go through your pre-match exercises on every occasion. Equipment, too, has a big part to play. 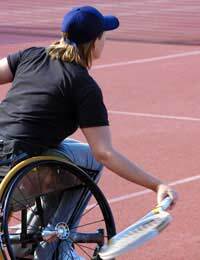 The increasing number of sports accessible to wheelchair users means that a standard chair is simply not capable of allowing players to compete beyond a basic level. They neither possess the manoeuvrability or turn of speed that is going to allow for a competitive game of, for example, rugby or tennis. The solution has been the development of equipment technology to meet these new performance demands. So chairs that are light yet strong, manufactured from suitable materials such as carbon fibre, are now available. They address both the demands for performance and provide greater safety through increased strength and stability. Prices vary so it is a good idea to have a good look at the market before buying, but as a guide, you could be looking at upwards of £500. This represents a sizeable investment, so what do you do if you just want to try out a sport to see if you like it? The solution is to ask the trainer or organisers whether there is a spare chair available. Great Britain Wheelchair Rugby, for example, has a number of such chairs available for this very purpose. The nature of individual sports mean that they will make different demands on both the player and the chair that they are using. As a result, you will find chairs specifically designed for the sport that you participate in. Not only that, you may find that there are different types of chair for a specific role that a player performs within the team. In rugby, there are both offensive and defensive chairs; basketball has three categories of chair: forward, centre and guard. The final piece in the safety jigsaw is to ensure that you play in facilities designed for the purpose and under trained supervision. In the past, the absence of such facilities made sport inaccessible to a great many wheelchair users but, happily, well targeted investment has changed the picture very much for the better. And not only will good facilities and good coaches ensure that your safety is assured, but they will also provide the foundations for performing to the maximum and making steady improvement. The British Paralympic Association is always on the lookout for new talent. It’s too late for Beijing 2008, but who knows, it may be you that is preparing for London 2012.